113 squadron was established on 4 October 1955 under CO Beni Peled, to become the first unit to operate the MD450B Ouragan. Interestingly, the aircraft were withdrawn from Armee de l'Air fighter wings EC12 and EC4. The SPA89 insignia of 2e Escadrille of EC1/12 Cambresi, (a wasp on a red lightning bolt), bearing a remarkable resemblance to the tail badge subsequently adopted by 113 sqn. The squadron strength was initially 24 Ouragans, declining to 20 examples by 1961. The unit achieved its first aerial victory on 12 April 1956, when one of two Egyptian Vampires patrolling the Negev area was shot down. 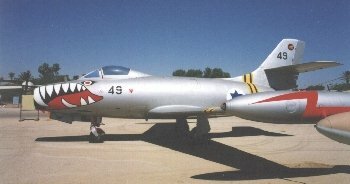 The Ouragans were initially operated in natural metal finish, but a camouflage finish was applied after the arrival of the first Mystere IVAs in April 1956. In the opening rounds of the Suez campaign, from 29 October 1956, Ouragans were extremely effective in attacking Egyptian ground positions in the Sinai. The type claiming a major proportion of the armoured vehicles destroyed, together with a half share of the destroyer Ibrahim el-Awal (on 31 October). Four more Vampires were also shot down on 30 October, and a MiG-15 fell victim later. In total, just two Ouragans were lost to ground fire during the Suez operation - and none to air action. 113 sqn became an OTU in 1957. The unit continued to recieve deliveries of Ouragans in small batches until November 1964. 113 Squadron and 107 squadron were still operating the type in June 1967 when the Six Day War broke out. Ouragans and Mystere IVAs being directed against Egyptian airfields in the Sinai on 5 June, followed by raids on the Syrian And Jordanian fronts. A total of eight Ouragans were lost by 113 sqn in the conflict. Shortly after the war, the two Ouragan units were concentrated into 113 sqn, which resumed its OTU role. The War of Attrition saw continued operational use of the type, two Ouragans being lost in an attack mission over Jordan on 21 March 1968, while missions against Egypt were also flown. From the summer of 1970, operational missions were abandoned. In November 1972 the first Neshers began to arrive, and in January 1973 the Ouragans were finally retired from service. Operated exclusively in the interception and air superiority role, the locally built IAI Nesher proved its worth in the Yom Kippur War later in the year. 113 sqn claimed 25 kills in air combat for no loss. In 1976 the squadron commenced conversion to the Kfir C-1, becoming the second unit to operate the type, and at the same time reverting to its previous fighter-bomber role. 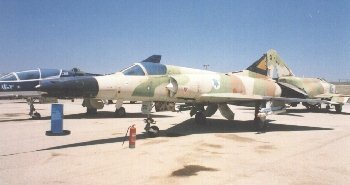 The units' operational capability was demonstrated when four aircraft attacked PLO positions at Tel Aziyah, Lebanon, on 9 November 1977 - the first such raid by any Kfir unit. Just over a fortnight later, on November 21, four aircraft of the same unit escorted the Boeing 707 of Egyptian President Anwar Sadat back home after his historic visit to Israel. In 1979 the more capable Kfir C-2 model replaced the earlier version. The type was used effectively during the invasion of Lebanon , June-August 1982, including attacks on Syrian GCI And SAM radars located in the Lebanon valley, and on PLO positions in the siege of Beirut. The squadron was disbanded in 1987, as the Kfir was gradually phased out of service due to Israeli defence budget cuts. A reformed 113 squadron took delivery of the first AH-64A Apache attack helicopter in September 1990, and is currently the sole operator of the type. To supplement the original batch of 18 Apache helicopters, 7 more examples were delivered in mid Sept 1993, increasing the total to 25. 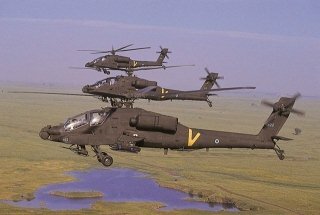 Further deliveries in December 1994 from the US Army are being used to form a second Apache squadron with 18 helicopters (127 sqn at Palmachim). 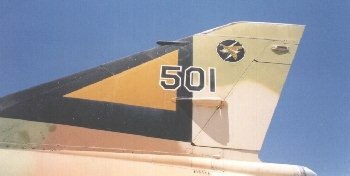 Although this unit has used the sharksmouth insignia, not all IDF/AF aircraft so painted belong to this unit. This especially applies to the F-4E, the subject of another official disinformation campaign. AH-64A serial 822 and two others in formation.